The little growth that is occurring is confined to a relatively few regions. See how your area compares. In most metro areas, more businesses are closing up shop than opening their doors, a worrying trend several years into the economic recovery. A new report from the Economic Innovation Group (EIG) highlights the declining number of new startups, revealing a stark reversal from decades of growth. To make matters worse, much of the new companies are concentrated in relatively few areas. “Most metros are actually losing ground in businesses," said John Lettieri, director for policy and strategy for the Washington-based think tank. "It’s a totally new phenomenon." Nationally, the EIG study found more firm closures than startups in nearly two-thirds of all metro areas in 2014, the latest year with available data. Startup rates, or the share of all companies formed within the past year, had exceeded closure rates every year since at least the 1970s -- even during recessions. That all came to a halt in 2008 with the economic downturn. While it’s normal for growth to diminish somewhat during economic recoveries, it has been slower than usual: There were still 182,000 fewer businesses in 2014 than in 2007, according to the report. In addition, growth has become more concentrated across larger regions. Consider the New York City area: It added firms in 2014, yet its neighbors -- Bridgeport, Conn., and Trenton, N.J., -- registered net declines. Similarly, the Southeastern metro areas of Atlanta, Charleston, S.C., and Charlotte, N.C., experienced growth, while nearly all their neighbors lost more firms than were created. “The cities we see that are the most dynamic tend to have a mix of things that support each other,” said Steve Glickman, EIG's executive director. The study also highlights a widening gap between small and larger regions, with bigger metro areas seeing new startups at notably higher rates. Most of the metros with the lowest startup rates were smaller industrial towns scattered across the Midwest. Cape Girardeau, Mo., and Lake Havasu City, Ariz., incurred the highest rates of business closings compared to openings since 2010. Regions with stagnant economies aren’t necessarily plagued by higher rates of firm closures, but rather much lower rates of business openings. In only one of the 20 metro areas EIG reviewed with the lowest rates of business churn, or the pace of turnover among new and closing firms, openings exceeding closings. So why do new firms matter to a region so much? For one, they create millions of jobs a year, while more established businesses historically have eliminated more jobs than they’ve created. For another, new firms that survive a few years often experience rapid expansion while putting pressure on existing companies to advance and increase productivity to compete. What's more, workers in dynamic economies swap jobs more frequently, driving up wages. A lack of new businesses, said Glickman, shrinks the middle class and further exacerbates wage inequality. Local governments have pursued a variety of policies promoting startups. Many launch business incubators or accelerators. Some implement workforce training programs that arm workers with skills that might lead one to start a business. And others help ease the transfer of new technologies stemming from research and development at universities to the private sector, which often results in startups. The University of Cincinnati participates in a water technology cluster with area businesses and other public institutions, for example. For regions where startups are more scarce, there's ample incentive to encourage more growth. "The real concern is 10 years from now," said Glickman. "If these cities continue on this trend, they'll die out economically." 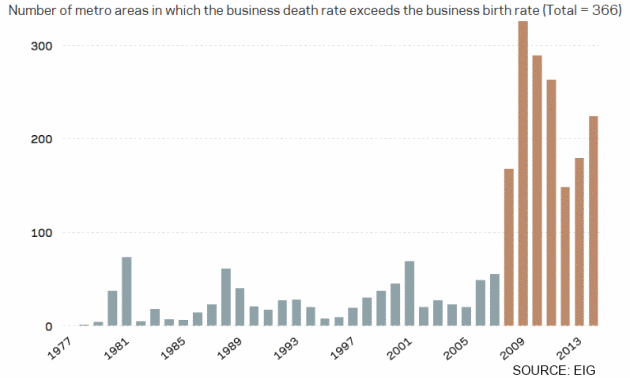 Birth and death rates shown refer to shares of all businesses in an economy that opened or closed in a given year. See the EIG report for additional data.